Do you sometimes share your human food with your dog out of the same container? Are you likely to trust dog lovers blindly on sheer principle? Have you ever sat across from a dog therapist, and found yourself talking about your own life problems instead? 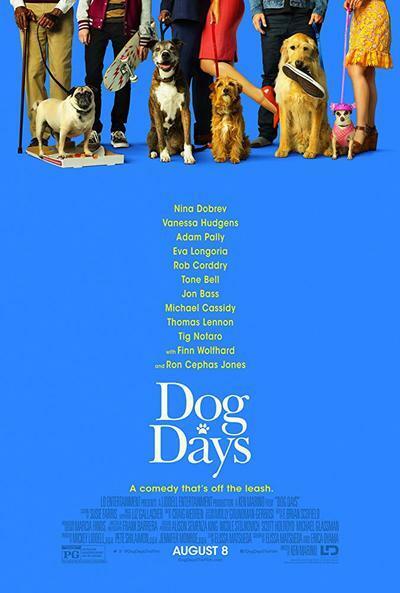 If you answered “yes” to any of these questions (or, to all three, like I did), then you will adore the sweet, Los Angeles-set ensemble comedy “Dog Days”; a family-wide rom-com as eager to please as its loveable canine stars with big personalities. Even if you didn’t have an affirmative response to any of the above, rest assured that director Ken Marino’s contemporary tale of intertwined lives will still disarm you eventually with its unabashed cheeriness and generous spirit. In the cinematic tradition of “everyone’s connected” yarns like “Crazy, Stupid, Love” and “He’s Just Not That Into You” (except, as inoffensive as they come), with a little “Best in Show” thrown in for good measure, “Dog Days” follows a crowded group of interrelated LA dwellers, whose lives are touched and made complete by dogs in various heartwarming ways over one heated summer. For the successful newscaster Elizabeth (Nina Dobrev, sufficiently neurotic), her expressive mutt Sam serves as a reflection of her own thorny feelings on the heels of an ugly romantic breakup. When she opens up to the poker-faced and hilariously overpriced dog therapist Danielle (Tig Notaro) about Sam’s abandonment fears, it’s easy to spot at once that she is talking about herself while leaning on her loyal best friend to get through a difficult time. Both Elizabeth’s and Sam’s luck turns when they meet-cute with the former NFL star Jimmy Johnston (a charismatic Tone Bell) and his adorably energetic pit bull mix Brandy. Things get even more complicated when Elizabeth and Jimmy are paired as co-anchors due to their bouncy love/hate chemistry. Equally dependent on a four-legged life partner is the melancholic Walter (Ron Cephas Jones), an aging widower with an overweight pug named Mabel, who connects Walter to happy memories of his deceased wife. When Mabel goes missing, the notorious loner reluctantly teams up with his neighborhood’s well-meaning pizza delivery boy Tyler (Finn Wolfhard) to locate his missing friend. While the two bond over a shared purpose with a cross-generational friendship akin to Carl Fredricksen and Russell from Pixar’s “Up,” Mabel lands with Grace and Kurt (Eva Longoria and Rob Corddry), and their observant adopted child Amelia (newcomer Elizabeth Phoenix Caro)—in no time at all, Mabel brings them closer as a family. Meanwhile Tara (Vanessa Hudgens, delightful), a cheery barista with big dreams, takes care of the stray Chihuahua Gertrude and helps the sweetly love-struck, socially awkward dog rescuer Garrett (Jon Bass) save his struggling dog adoption business New Tricks. Tara’s non-dog-friendly building is also a home to the unkempt man-child Dax (Adam Pally), who secretly takes in his pregnant sister Ruth’s troublemaker labradoodle Charlie to lend her a helping hand. Co-written by Elissa Matsueda and Erica Oyama, “Dog Days” quickly proves its unusually sensitive understanding of selfless dogs and the messy humans who take care of them. Contrary to Hollywood’s age-old tendency to use dogs as cute items of comic relief, “Dog Days” allows its canine population the freedom to be realistic dogs that are respected by their human counterparts—they play, jump, run, sulk and even get into trouble like our pets sometimes do, without ever becoming lazy, throwaway plotlines. Despite a crowded field of players, Matsueda and Oyama fully close the circle on the stories of each of the film’s canines and humans, spreading kindness and hope as effectively as a dog’s shake-off and tail wag. Admirably, the writing duo don’t shy away from the sad parts of pet parenting and treat the much feared but inevitable departure of our furry pals with the dignity it deserves. The script’s jokey dialogue tends to get a bit stiff at times and Marino’s direction isn’t exactly inspired—an overdone, over-lit visual artificiality stifles “Dog Days.” Yet, anyone who’s ever felt altered by an animal companion will easily find something to love in this shamelessly happy, defiantly nice film that celebrates amity among families, neighbors, generations and even different species. The best part? No other summer flick this year will include a scene with a stoned dog, cutely watching the ever-trippy “Attack of the Killer Tomatoes.” That’s a guarantee.